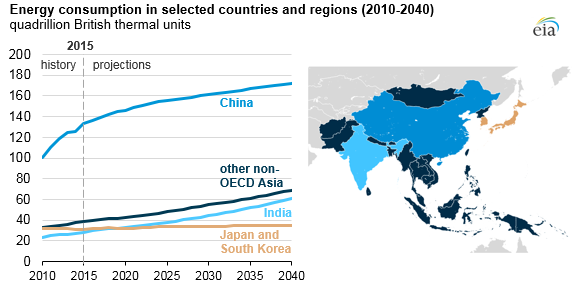 Based on projections in EIA’s International Energy Outlook 2017 (IEO2017), much of the future growth in world energy consumption will occur in the nations of Asia outside of the Organization for Economic Cooperation and Development (or non-OECD Asia). Although China and India account for most of the region’s energy consumption, EIA projects broad growth in other Southeast Asian nations, including Indonesia, Thailand, and Malaysia. 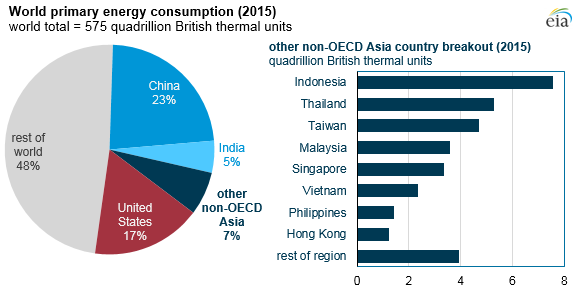 These other non-OECD Asian nations are relatively small consumers of energy individually, but collectively they accounted for 7% of world primary energy consumption in 2015. IEO2017 projects that by 2040, the nations of non-OECD Asia excluding China and India will account for nearly 10% of the world’s primary energy consumption. These countries’ collective gross domestic product (GDP) is projected to nearly triple between 2015 and 2040, far outpacing population growth, which is expected to increase by 30% between those years. Projected economic and demographic trends lead to a strong increase in average household income, from about $5,000 (in real 2010 dollar terms) in 2015 to more than $12,000 by 2040 in the IEO2017 Reference case. The nations of other non-OECD Asia share many structural similarities and trade links with the growing economies of China and India, such as a relatively low cost of labor, rising personal income, and capacity for infrastructure growth. Similar to what has happened in China and India, the agricultural sectors in these countries are expected to decline as a share of the economy, while their construction industries grow to accommodate increasing urbanization. Energy-intensive manufacturing, including motor vehicle and chemical production, are also expected to grow rapidly. 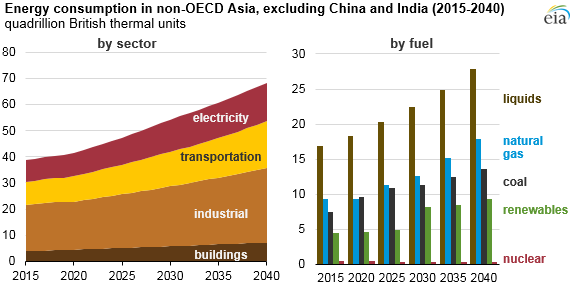 Altogether, industrial energy consumption in other non-OECD Asian countries excluding China and India is projected to increase by 60% between 2015 and 2040. Urbanization and rising standards of living are key components to increased energy use in transportation and in buildings in the other non-OECD Asian economies. IEO2017 projects passenger travel to more than triple between 2015 and 2040. Equally significant are the projected shifts in transportation modes. In 2015, about 30% of travel in these countries was in automobiles; by 2040, EIA projects that share to reach nearly 50%. The growth in automobile travel comes at the expense of two- and three-wheel vehicles and mass transit, which are relatively more fuel efficient. Other forms of travel are also expected to increase. Freight travel increases as a result of growing manufacturing sectors, improving infrastructure, and rising personal incomes. Most of the energy consumption associated with freight travel is in international marine transport, but EIA expects on-road freight transport to increase as well. Urbanization in the IEO2017 is also forecast to contribute to an increase in demand for electricity and natural gas in buildings. Rising standards of living in non-OECD countries increase the demand for electric appliances, equipment, and commercial services. Residential and commercial coal use remains relatively low, while natural gas use for cooking and heating increases.